This is the recipe for keto brownies you’ve been waiting for. 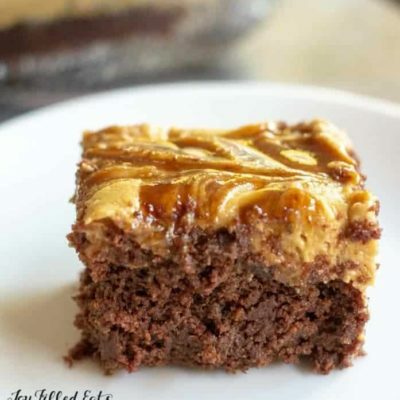 Rich brownies topped with coffee buttercream AND caramel sauce. They are so decadent just a few bites is all you need for your caramel macchiato craving. This is one of the most indulgent recipes I’ve ever made. 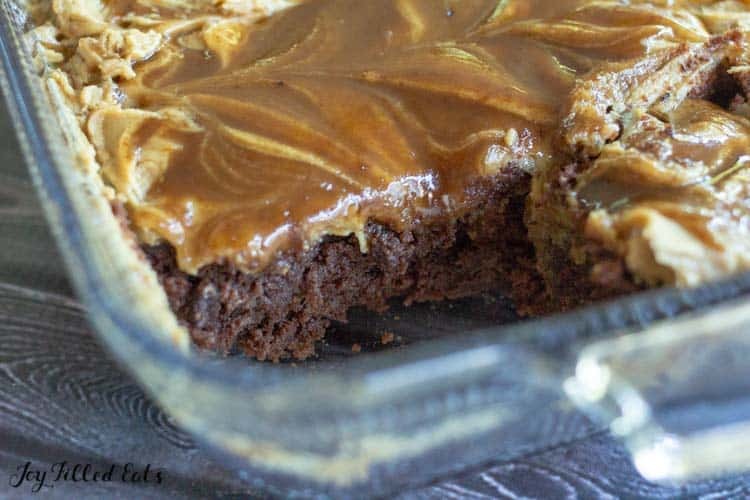 Chocolate keto brownies with coffee buttercream icing AND caramel sauce? Oh yes. I had no problem taste testing these last Friday after a long week. There are many variations on a traditional brownie recipe. To start you need either cocoa powder, melted chocolate, or both. This keto brownie recipe calls for cocoa powder. This is based on Hannah’s Fabulous Low Carb Brownie Recipe. 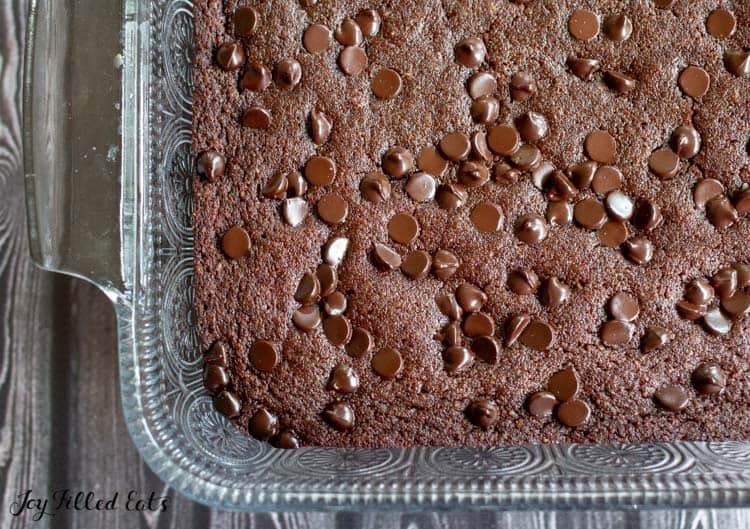 Hannah’s brownies were one of the first guest posts I’ve featured and are still one of the most popular. 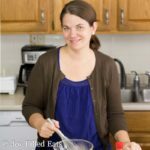 For keto brownies, you need chocolate, a sweetener, most of the time you need a flour, and then a binding agent like eggs. The ingredients are simple and if you’ve done any low carb baking you probably have most of them in your pantry already. I’m a dump and mix kind of girl. My favorite recipes are ones that you add everything at once then mix it up. Simple. Fast. Done. With 5 kids in the house using every cup and plate in my cabinets I try to keep the dishes I use to a minimum. 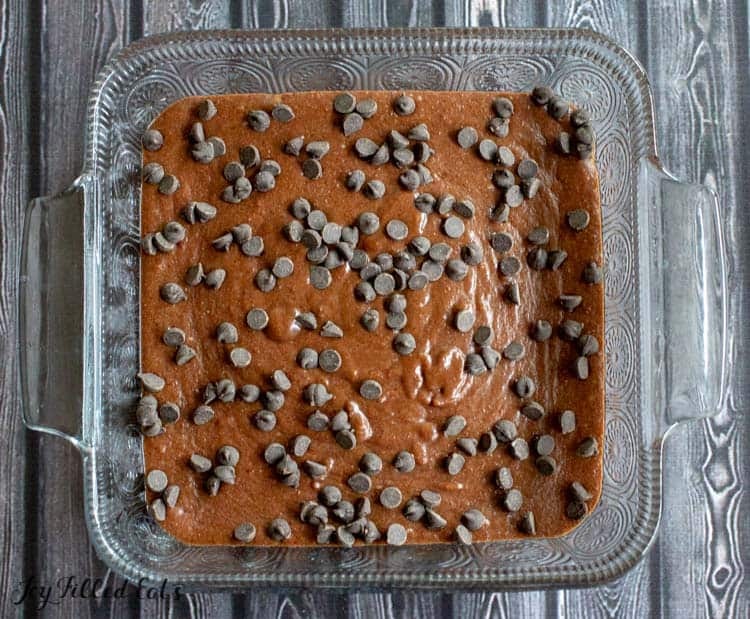 Mix up the brownie batter, put it in an 8 x 8 baking dish and bake. 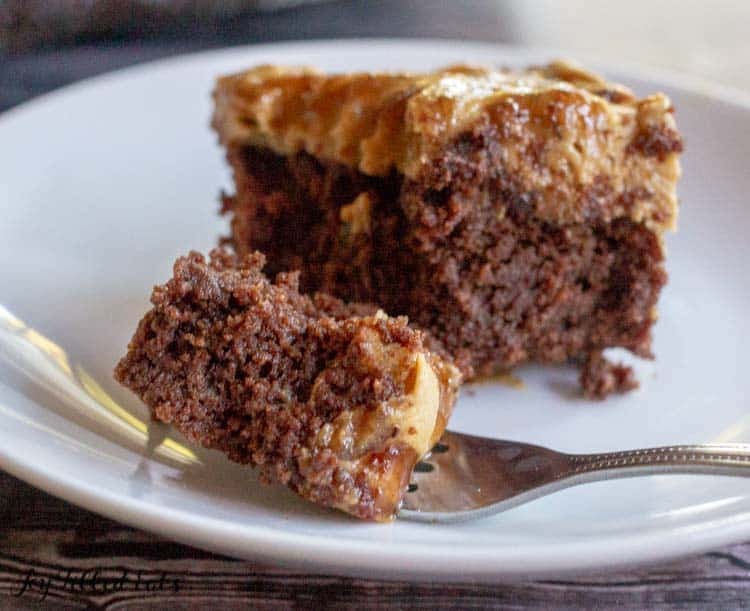 The chocolate chips are optional in this recipes because once you cover the keto brownies with coffee buttercream and caramel sauce you really don’t need them. Buttercream is my favorite type of frosting hands down. It is SO easy to make and it’s just as easy to make it sugar-free as to make it with regular sugar. To make a perfect buttercream all you need to do it whip up some butter and add powdered sweetener. In almost all of my recipes, I just use my sweetener blend of xylitol, erythritol, and stevia. 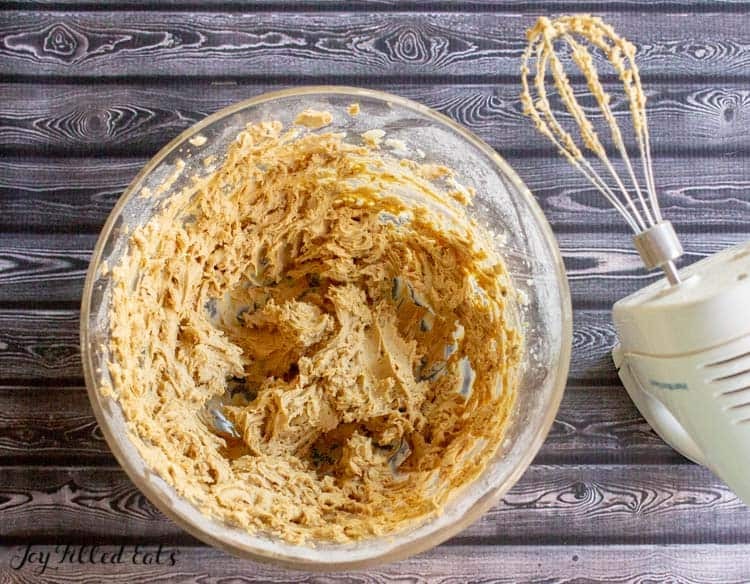 Buttercream is one recipe that I do recommend using a powdered sweetener such as Swerve. You can grind your own sweetener at home but it’s hard to get it as powdery as professionally ground sweeteners. 1. Start slow. It is easier to turn up the heat for a caramel that is taking too long than to try and save a burned caramel. 2. Whisk, whisk, whisk. I’ve made caramel enough that I’m confident leaving it unattended in the early cooking stages but if you are new to caramel making stay at the stove and watch it. The ingredients for a sugar-free caramel are not something you want to throw away. 3. Go by smell and color. I know my caramel is done when it is a deep golden brown, smells very fragrant, AND has some darker bits at the bottom of the pot. As soon as this happens, remove the pot from the heat immediately and whisk furiously to reduce the temperature. 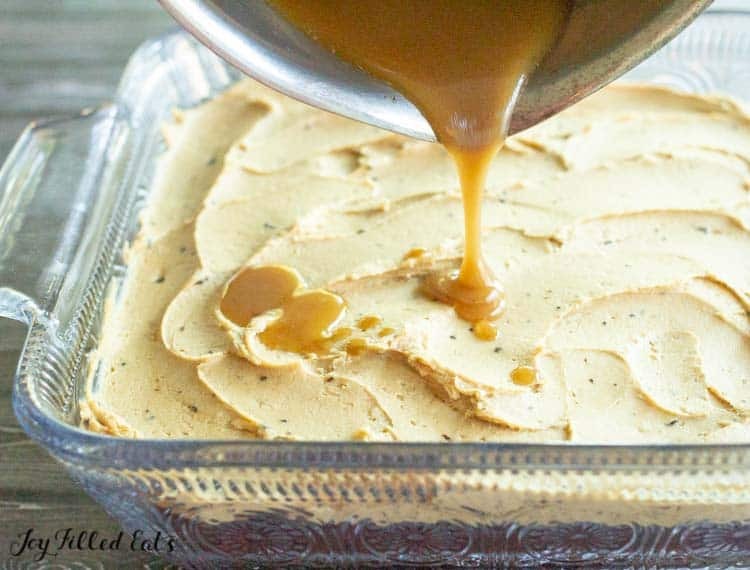 Some of my caramel recipes call for some extra butter or cream added at the end to reduce the temperature quickly but that isn’t always necessary. I love swirling pretty designs in icing. 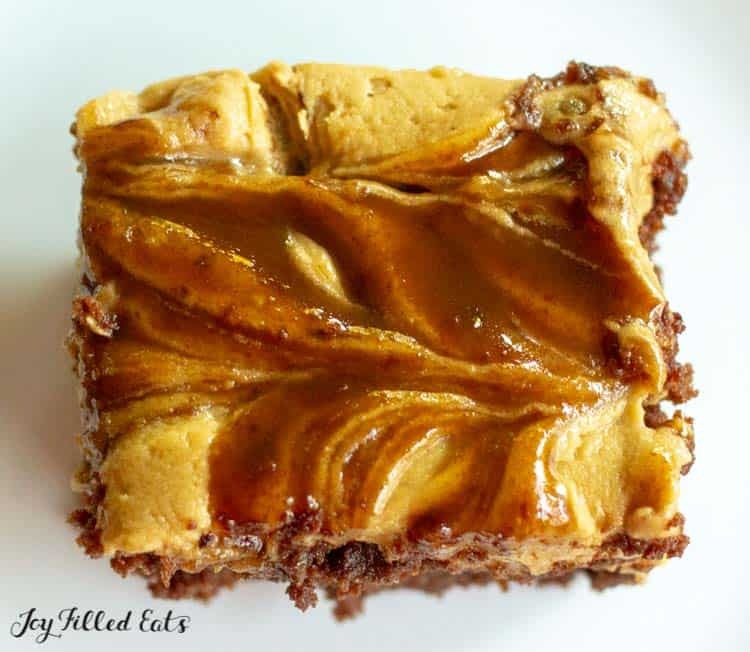 To make this one on my Caramel Macchiato Keto Brownies just alternate dragging the knife back in forth horizontally and then do the same thing vertically. After my first go at this recipe, I cut the amount of buttercream frosting in half. They came out too sweet. But if you have a real sweet tooth and want an over the top indulgent dessert go ahead and double the buttercream recipe listed! Any time I mention my leftover brownie truffles I get odd looks. Leftover brownies? Who has those? Maybe I am the only one but if you are baking just for 1 or 2 sometimes you can be left with half a tray of brownies that you are tired of eating for dessert after 6 nights in a row. You could freeze them. Or you can make truffles. This was one of the easiest recipes I’ve made Fudge Brownie Truffles from because the topping has so much moisture you don’t need to do anything else. Smush them, mix well until you have a smooth dough, shape into balls and either dust with cocoa or dip in melted chocolate. Then enjoy the best mocha truffles you’ve ever tasted. 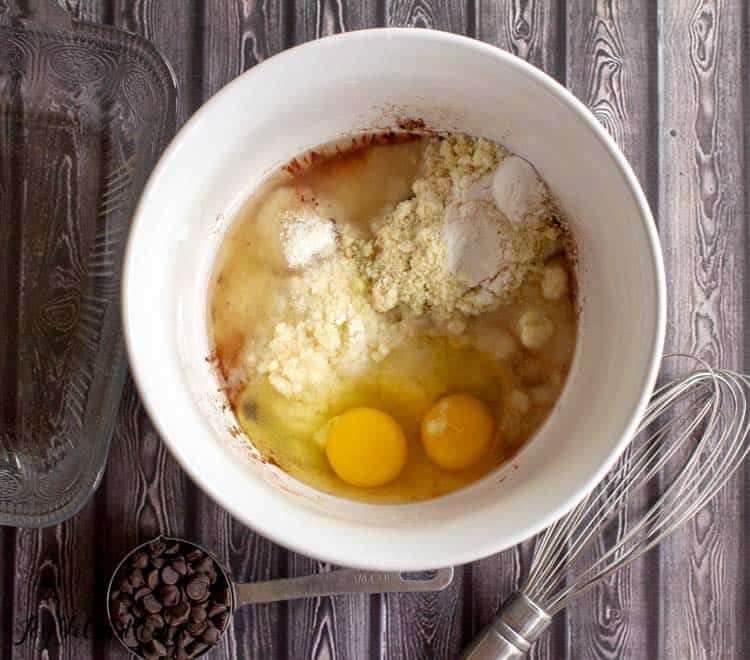 This is the recipe for keto brownies you've been waiting for. 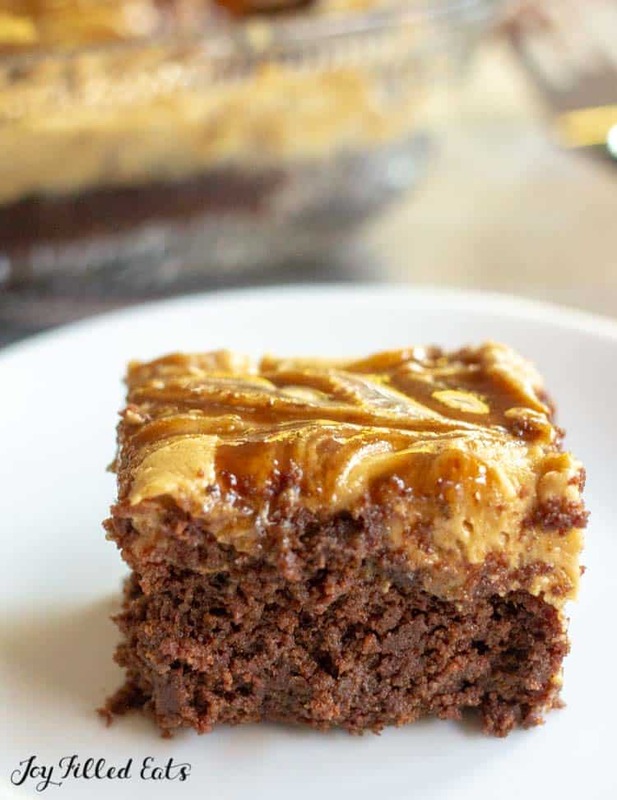 Rich brownies topped with coffee buttercream AND caramel sauce. They are so decadent just a few bites is all you need for your caramel macchiato craving. Preheat the oven to 350. Grease an 8 x 8 baking dish. Stir together the wet ingredients. Add the dry ingredients. Spread in the greased baking pan. Sprinkle on the chocolate chips, if using. Bake for 25 minutes until no longer jiggly in the middle. Cool to room temperature. Mix the half and half and instant coffee granules in a medium bowl until dissolved. Add the butter and cream cheese and beat until fluffy. Add the powdered sweetener and vanilla and beat again until fluffy. Combine the sweetener, cream, and butter in a medium saucepan. Cook over medium, stirring frequently, until deep golden brown and thickened. Depending on the heat of your stovetop this can take 10-15 minutes. Watch it carefully. Cool for 5 minutes before assembly. Gently spread the buttercream on the cooled brownies. 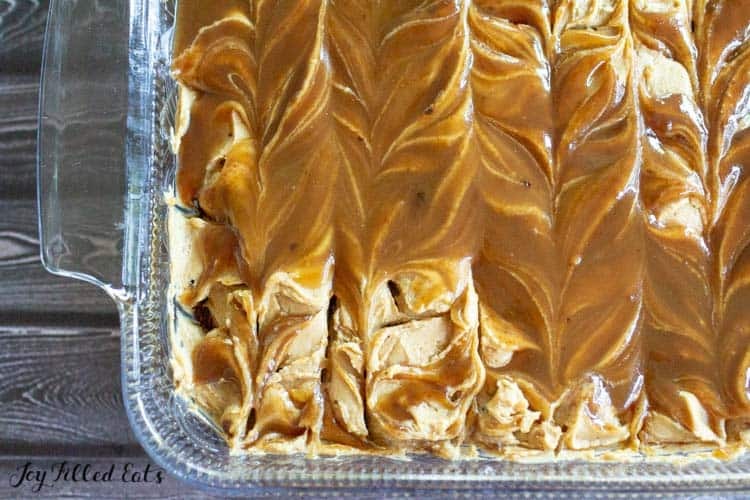 Pour the caramel sauce on top of the buttercream. Swirl with a butter knife making zig-zag lines one way and then the other. Enjoy! Caramel sauce came out in clumps. Cooked to long? Which sweetener did you use? Did it taste burned? Did not taste burned . But did not drip like yours. It ate well. Family ate it. One piece left. I like monk fruit. If you decide to use it you will need more. It is 1:1 for sugar. Gentle Sweet is 2:1. Yes. The caramel sauce will crystallize but they are still delicious. It's just more like a toffee than a caramel at that point. I’ve seen you talk about using ground raw sunflower seeds as a sub for almond flour to make something nut free. Would that work in this recipe? Yes, I think so. I haven't tested it in every recipe yet. If you try please lmk how they turn out! This is wonderful!!!! So much flavor in every bite. My favorite coffee shop drink turned into a delicious treat! I love this! The sweetener in the buttercream came out grainy. Did you use powdered erythritol, like Swerve?